Men´s interior thermal short sleeve t-shirt with round collar. T-shirt available in white Winter t-shirt. Interlock plush knit in 100% Cotton. Rapife 100% made in Spain. V-neck T-shirt drop needle interlock (napped) 100% combed cotton. 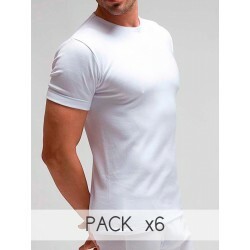 Men´s thermal interior short sleeve v-neck t-shirt. T-shirt available in white Winter t-shirt. Interlock loose knit plush in 100% Cotton. Rapife 100% made in Spain. T-shirt V-neck (napped) 100% combed cotton. Pack 3 Unds. T-shirt 100% combed cotton. Pack 3 Unds. Men´s interior short sleeve t-shirt with round collar. Available in white. Garment suitable for all year. Rapife 100% made in Spain. Men´s interior short sleeve thermal v-neck t-shirt with round collar.Winter t-shirt.Rapife 100% made in Spain. Men´s interior long sleeve thermal v-neck t-shirt.Winter t-shirt.Rapife 100% made in Spain.